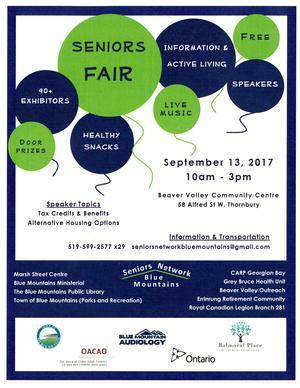 Seniors Network – Blue Mountains, in partnership with the Older Adult Centres’ Association of Ontario (OACAO), will host its 2nd Blue Mountains Seniors Information and Active Living Fair on Wednesday, September 13th, 2017. The fair will run from 10am to 3pm at the Beaver Valley Community Centre at 56 Alfred Street West in Thornbury and admission is free. If you are a senior or caregiver in the area this is a great way to connect with many available resources including: caregiving; tax information; housing options and supports; safety; health and pharmaceutical information; meal related options; and others. There will be more than 40 exhibitors, presentations, healthy snacks, door prizes, and more. Seniors Network - Blue Mountains was formed in 2014. It includes representatives of Blue Mountains Ministerial, Town of Blue Mountains (Parks and Recreation) the Blue Mountains Public Library, Marsh Street Community Centre, Beaver Valley Outreach, Errinrung Long Term Care Home & Retirement Community, Royal Canadian Legion Branch 281 (Beaver Valley Branch), the Grey Bruce Health Unit and CARP Georgian Bay. The network aims to provide information and raise issues of interest to seniors in the Blue Mountains area.